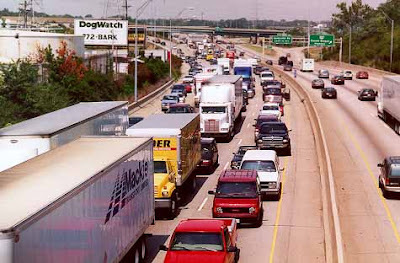 Cincinnatians traveling along the Interstate 75 corridor can now go to bed at night knowing that they drive the worst stretch of interstate in Ohio, and one of the worst in the entire Midwest according to a recent analysis by The Daily Beast. The Daily Beast ranked the nation's metropolitan areas with the worst rush-hour congestion based on peak hour Travel Time Index (TTI) for each particular highway segment. Once the 75 worst metropolitan areas were determined, the worst highway in each area was defined according to the most hours of bottleneck congestion. For Cincinnati, I-75 racked up 86 hours of weekly congestion with the worst bottleneck occurring at Exit 10 (map) for southbound traffic. The worst bottleneck stretches on average some .46 miles, with speeds of approximately 21mph, and adding up to 16 hours of bottleneck time each week. What becomes particularly problematic for Cincinnati is ODOT's approach to handling congestion. 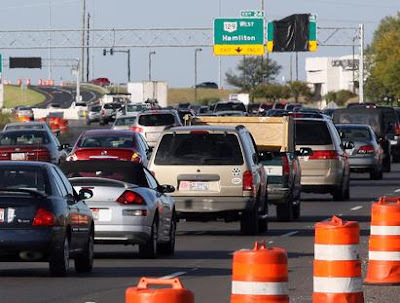 This past fall ODOT spokesperson Liz Lyons told the Cincinnati Enquirer, "the main gist is widening, adding more lanes for traffic to flow easier," when it comes to handling the congestion and daily gridlock on Ohio's worst stretch of interstate. 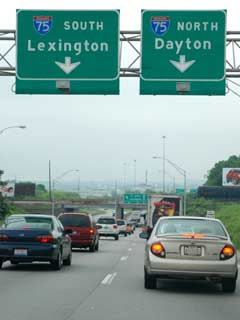 Cincinnati's stretch of Interstate 75 is the most congested in Ohio, and one of the worst commutes in the Midwest. Interstate 75 congestion photos from Scott Beseler, Nick Daggy, and Jake Mecklenborg respectively. The reality is that ODOT's plan to add, at most, one lane of traffic to this section of I-75 will do nothing more than cause tremendous headaches over the course of its construction and not achieve any congestion savings. The direction of transportation planning in the 21st Century is all about mobility options. Our aging population and the new workforce both desire increased mobility options more so than the immediate convenience of an automobile. European cities are far ahead when it comes to creating mobility options, but in America there are a few examples where mobility has been placed as the top priority when it comes to transportation planning. Interestingly enough, the cities that have done this are among those trying to make up the most ground on cities like older built cities like Cincinnati that have inherent mobility advantages. Cincinnati's extensive street grid and compact neighborhoods that were built prior to the Eisenhower Interstate System offer lots of positives upon which to build. Additionally, Cincinnati's aging demographics and 21st Century employment sectors represent a real opportunity to not only reduce congestion, but remove the need for automobiles altogether. Multi-modal transportation options like the Cincinnati Streetcar will promote neighborhoods in which people can live closer to their jobs and be only a short train ride away from their job, shopping, or entertainment destination. So the question is whether Midwestern cities like Cincinnati will continue to try to solve 21st Century problems with 20th Century solutions, or will policy makers here finally have that "ah-ha" moment and start planning our transportation networks around options? $800 million for 7.9 mile stretch of 1 lane on 75. I agree that the congestion on that stretch of highway is bad, but as a former Chicago area resident, I would take it over Chicago any day. In Cincinnati, your commute may be 1/2 hour longer because of traffic; in Chicago, plan on sitting in traffic for multiple hours at times. Blech. It's always really hard to go back home because of that very issue. Obviously we need to invest in more alternate transportation options, but our stretch of I-75 is pretty embarrassing. My understanding is that the construction is also going to eliminate the left lane exits that are frequent near downtown which require drivers to careen across multiple lanes, such as if one is trying to take I-75 to get from Hopple Street to Fort Washington way. I'm against widening highways on the assumption that it will ease congestion, but this is a stretch of highway that needs to be simplified.